Parents and educators are the experts on what New York City's children need to get a great education. 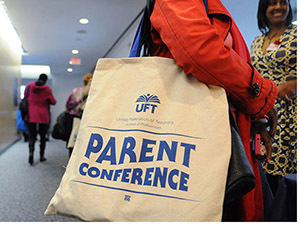 That's why the UFT has worked hard over the years to ensure that parents have a voice at their child's school and in the school system. This section explains the key people and organizations at your child's school that can help you to resolve issues and become involved in school-level decision-making. Parents should have a voice throughout the school system. This section gives you tips for understanding and influencing the system beyond your child's school.